Welcome once again to another edition of spoiler week! Our second installment of Conspiracy will begin now! We now have our first rare Conspiracies, both of which do not include Hidden Agenda and can be found face up at the start of the game. Backup Plan does exactly what most people want: draw two hands and choose the best one, then shuffle the other one into your library. This cuts down on any problems with having mana. 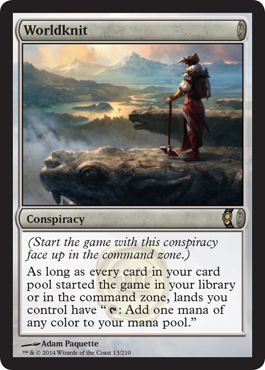 Worldknit is a very interesting card and fixes mana problems as well by making all your lands tap for any color. I have to say, I'm already loving this new card type and I love the set so far. 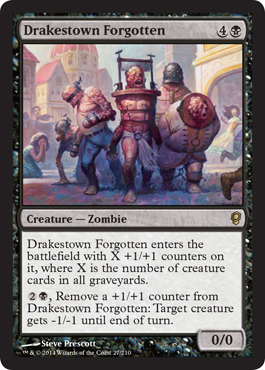 We also get a cool zombie who plays off the graveyard and allows you to give creatures -1/-1 by taking off counters from Drakestown Forgotten. 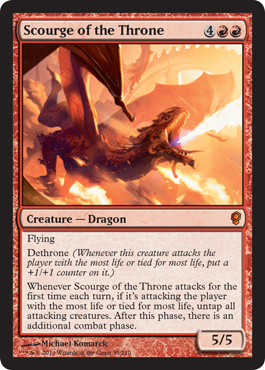 We even have another draft modifier in this set (go figure, right?) and it's actually pretty great. 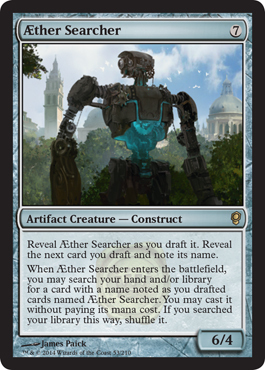 Upon drafting this card, the next one you draft you can search for it and cast it for free when you play this giant creature. 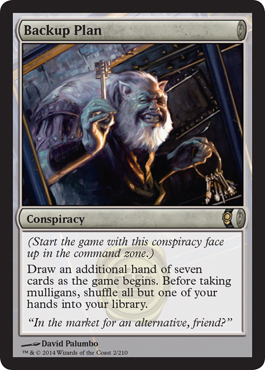 We even have several reprints that have shown up, so hop over to our Conspiracy spoilers page to check out the spoiled cards.